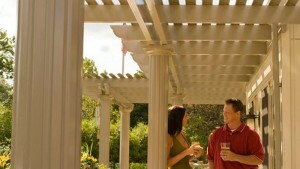 U.S. Patio Systems and Home Remodeling is an official dealer of TEMO pergolas serving Des Moines, Iowa. A pergola is a type of outdoor living structure that provides shade from the sun but not necessarily wind or rain. Pergolas are elegant shade structures that offer the perfect ambiance for outdoor gatherings. With a brand new TEMO pergola from U.S. Patio Systems and Home Remodeling, you can enjoy a semi-protected backyard space that is as comfortable as it is attractive. Attached – An attached pergola will use one of your home’s exteriors walls for partial support. The photo of the pergola at right is an example of an attached pergola. Freestanding – Freestanding pergolas typically have four support columns and stand separately from the home. Garden arbor – A garden arbor pergola from TEMO is the perfect option for creating a dramatic garden entranceway. Open-beam design encourages more sun exposure for the ground below and the growth of climbing vines. TEMO pergolas are among the best that are made in North America. They feature snap-fit construction, are resistant to weatherization and insect infestation, and come in a variety of colors and column styles. Please contact U.S. Patio Systems and Home Remodeling today if you are interesting in buying a TEMO pergola for your home anywhere in the Des Moines, Iowa, area. In addition to being an official dealer for TEMO pergolas, we also proudly specialize in TEMO sunroom installation, TEMO patio cover installation, basement finishing, bathroom remodeling, and more.